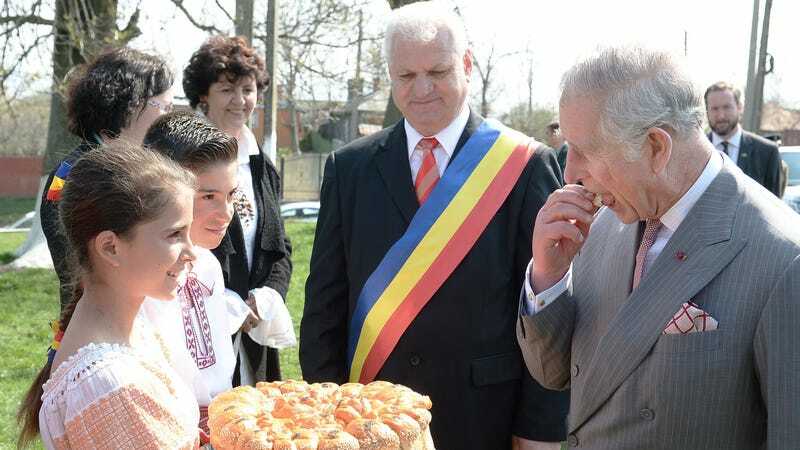 Prince Charles, Prince of Wales is offered bread and salt before a tour of the Roma village of Vizuresti on the third day of his nine day European tour on March 31, 2017 in Bucharest, Romania, which is not actually Transylvania, but he is eating. Photo via Getty Images. A spokesman for the mayor of the Transylvanian city of Alba Iulia said Charles had been offered the honorific title because of his promotion of Transylvania. Mihai Coser told The Associated Press Thursday that Charles is “more Romanian than many Romanians.” So far, he says there has been no response to the offer. It is not clear whether this mayor has any authority to offer Charles even so much as an honorary Transylvanian title, considering the Romanian monarchy—specifically, the Hohenzollern-Sigmaringen family—formally took their leave of the throne in 1947, around the time the Soviets tanks rolled in. However, Prince Charles is supposed to be distantly related to Vlad the Impaler through his great-grandmother, Queen Mary of Teck, though of course the family tree of 19th century European royals resembles nothing so much as a plate of spaghetti. Prince Charles became a staple of the Romanian nightly news, striding through fields with people who were scything hay by hand and piling it into tidy mounds that seem to have leaped out of a Van Gogh painting. The foundation works for the preservation of historic estates and the peasant homes built around courtyards that house a well, barn and granary that reflect the traditional pursuits of the area’s extended families. Prince Charles and other preservationists offer restored homes as guest houses and vacation homes for travelers, with the hope that tourism can provide economic support for sustainable agriculture and the traditional way of life. He noted his connection to Vlad and added, “I have a bit of a stake in the country.” DAD!!!!! !